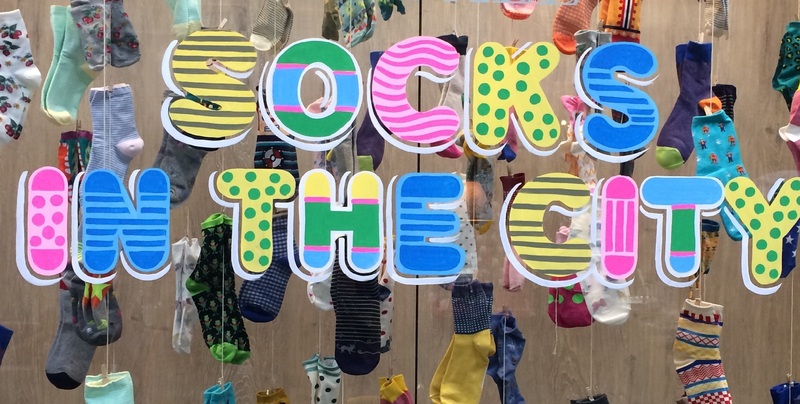 Socks in the City – What is Style? Love, love, love socks so here is my blog all about my favourite accessory of the moment. SOCKS!! As I wear boots most days, I’m always buying socks and have a dedicated sock draw, that is over-flowing. Whether they be short, long, frilly, patterned, thin, thick, multi-coloured or just plain black – they keep my feet lovely and warm and look great with my favourite pair of boots. I buy them from lots of places including Alannah Hill, Cotton-On, Route 66, Farmers, Platypus and often like to make a statement with my outfit, by wearing a colourful sock or two!. Perhaps I should be called the Sock Lady! My do’s and don’ts are pretty simple really. DON’T ever wear socks with Sandals (never a good look) and DO have fun with colours and patterns (no excuse to only ever wear black or white). Today I’m wearing my new floral Stance cushioned socks from Platypus – oh so comfortable! With it coming into winter, we’ll all be wearing lots more socks. No one wants cold feet!! Love your pics Yellow Tulip…. Socks are great! A girl can never have too many pairs of socks I say and surprisingly I only have 1 yellow pair. The kids here are wearing cute socks that come up to mid thigh and have cats heads on them – although they look like long socks, they are actually skin colored tights with “socks” as the design. Lots of fun. I love the sound of those socks, but perhaps not with the cats heads on them .. send me a photo if you can … sounds like fun socks ! !